It’s crunch time! As we approach opening night for our People’s Company production of Scenes from an Execution. The cast are in rehearsing, the tech team are hard at work, and everything is shaping up for a great production. 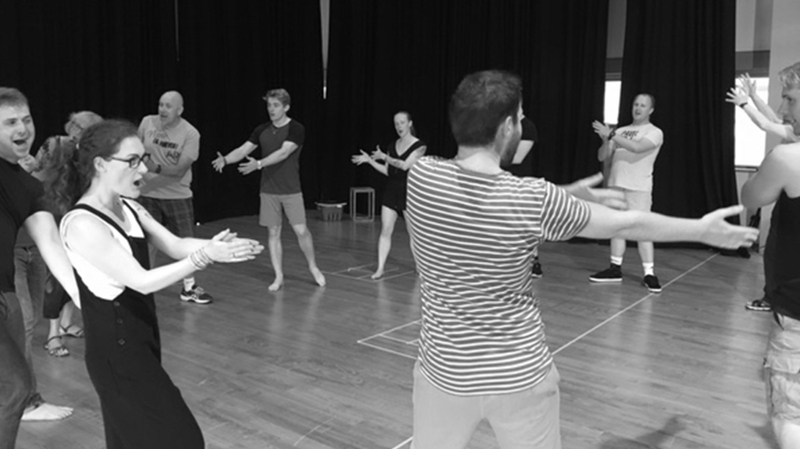 In our latest blog post we caught up with cast member Vince Sutton, who talks us through the rehearsal process and build up to the show! Why did you get involved with this PC production? I first found out about this production at a research workshop in January where we were introduced to Scenes From An Execution and another possible script. I loved Scenes right from the start – it’s language, the story and it’s potential were really exciting. There was no doubt in me that this was a production I really wanted to be a part of. To get the part of Urgentino, The Doge, was a huge bonus. How have you fond the rehearsal process, have there been any surprises or unexpected challenges? Rehearsing this show has been huge fun to be part of. The script has involved learning a lot of lines, which was relatively new for me – but the way the rehearsals have been structured seem to have made what seemed daunting becoming surprisingly comfortable and has given us all the confidence we need to bring the lovely characters to life. It can’t come too soon now, it’s going to be so exciting taking all that we’ve work on in the rehearsal rooms and seeing it come to life in The Drum. I hope that it is a week full of fun and energy, and a learning experience too! For myself, I hope I can do justice to ‘The Doge’, I loved the character right from when I first read him. And I hope that our audiences love the production as much as we all do. I always knew this was going to be a steep learning curve. The Doge has a lot to say for himself! Therefore I have had a lot to learn. I hope this is going to have given me the confidence and some of the experience to take on meatier roles. As for what is next – I’ve always wanted to have a go at some Shakespeare. I would say ‘anyone’! Scenes From An Execution is a great story, with great characters that you can really relate to. It’s got a message and although it’s set in 15th Century Venice, it is totally relevant to our world today. It’s also got a lot of humour. It’s a bit of a roller-coaster ride!